I recently reported, on realNEO: "On Thursday, April 7th, 2011, on the Green rooftop of the Environmental Health Watch Building, Environment Ohio released a new report showing that smog-forming pollution from Ohio’s power plants puts children’s health and Ohio’s environment at risk - Environment Ohio - Clean Air Program Reports - Dirty Energy’s Assault on Our Health: Ozone Pollution." Approximately 3.9 million children and more than 10.7 million adults with asthma live in regions with very high levels of ozone pollution. According to the United States Department of Health and Human Services, approximately 5,000 asthma-related deaths occur each year in the U.S. Children are particularly vulnerable. Children who grow up in areas with high levels of ozone pollution may develop diminished lung capacity, putting them at greater risk of lung disease later in life. Ozone exposure can impact prenatal health, with research finding that in-utero exposure to ozone is associated with lower birth weight and intrauterine growth retardation. According to NOACA - The Northeast Ohio Areawide Coordinating Agency - Northeast Ohio is in nonattainment of the Clean Air Act's National Ambient Air Quality Standards (NAAQS) for Ozone and other pollution... "By the end of October 2010, the region’s ozone levels exceeded established clean air standards 15 times, and fine particles (soot) exceeded standards three times. The U.S. Environmental Protection Agency is expected to tighten the ozone standards by the end of 2010, which would once again place all of Northeast Ohio into “nonattainment” of clean air standards." Yet, throughout National Air Quality Awareness Week...... SILENCE ABOUT OUR POOR AIR QUALITY!?!? I believe our air quality is even worse than reported by NOACA, as it appears our air quality monitoring has historically been defective. Perhaps that is why they are silent, this week? One of the primary rules of total quality improvement is that you cannot manage what you do not measure, which is why all TQI initiatives must include performance measurement, comparative analysis and ideally competitive benchmarking. When applied to the environment and pollution, this rule takes on greater meaning, as you cannot manage toxic emissions and so polluters without measuring air quality in the surrounding environment... and not maintaining proper air quality leads to measurable loss of human and other natural life on Earth. I have reported my concerns to the federal Environmental Protection Agency, and they have mounted an investigation. As I have documented, there has been a long history here of broken air quality monitoring - data that has been declared unusable for years, at one stage - many broken monitor issues throughout the past year that I paid attention closely - one monitor disappearing off the map - and irregular, frequent outages of data-reporting - data appearing to be changed manually. I have saved 100s of screenshots to document that. When you have chosen someone to discuss this with us, I will send them links to information on our monitoring issues, and any other documentation that is helpful. I would like to see an outside analysis or audit of the security of our environmental data, log files, processes, backup and recovery, etc - who has access and what processes are in place to protect integrity - and benchmarks of the reliability of our air quality monitoring equipment, service, staff and data for as long back as possible - % availability of each monitoring device and data stream for every station, reasons for outages, and durations of outages - review our process for everything - and a comparison of that to other Ohio and out-of-state comparable monitoring situations - best-in-class - and what is state of the art? I would also like to see an analysis of the placement and selection of monitoring equipment in place here relative to current pollution sources and EJ concerns, and best available science - do we have the right monitors in the right places to really assess impacts of major mobile and point sources - and to differentiate - and to measure and analyze direct impacts on citizens - especially EJ victims. Are we getting bang for our buck - are local and federal dollars being spent well - are staff doing their jobs - are we applying for available funding to always push for world-class environmental monitoring here - does our leadership pursue outside certifications, etc... participate in expert programs - push the envelop. Do we inspect well, relative to monitoring? 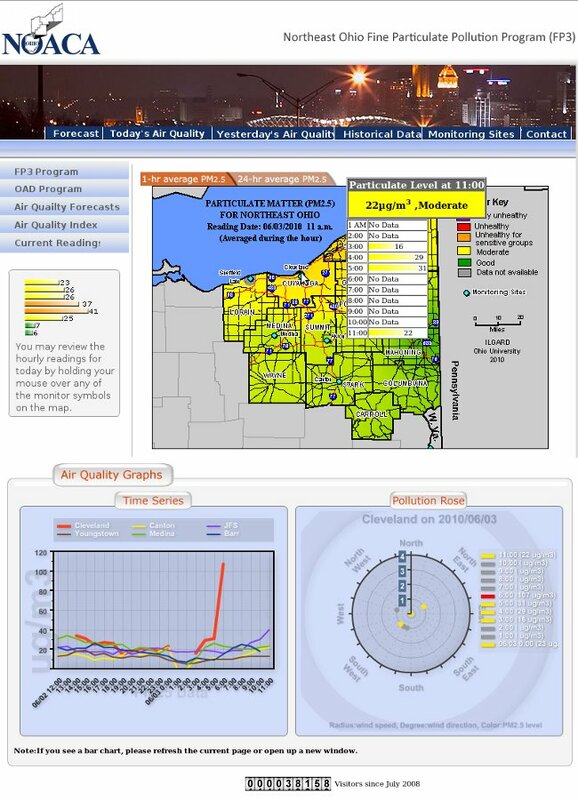 If there is any other environmental monitoring data available to the EPA from sources not currently available to the public, I request that be made available to the public, so we may see the latest science and data on our air quality - I believe there has been supplemental monitoring in Cleveland in the past few years and I have not seen any results reported. For what data is determined to be actual and accurate - and from equipment and locations to standards worth maintaining - I would like to see the pollution data included in a GIS system with other valuable data from our community - as much pollution and environmental hazard data as possible - TRI - gas wells - along with regional and local econometric data - county assessor data of property values - data of childhood lead poisoning incidences - asthma sufferers - diabetes - Alzheimer's - and income, education attainment, crime ... all the demographic data possible - we should be able to include weather data - wind - rain/snow - I want our environmental monitoring to be the state of the art. Once we may begin modeling current EJ concerns we'll see gaps and opportunities for refinements and add monitors to better understand real environmental impacts - use world class science in world class ways. We have plenty of talented, expert IT, public health and environmental planning people to execute this in Cleveland - excellent universities - and a will to lead with information technology and the environment - be the Green City by the Blue Lake - and if empowered to do something like this they shall excel. I have proposed global experts work with the EPA on developing world-class environmental modeling capabilities for Northeast Ohio, which will demonstrate the best efforts and science of the federal EPA. The best science available from the EPA is outstanding. Proving my points - highlighted in EPA Greenversations for today - Wednesday, May 4, 2011 - "EPA’s Atmospheric Modeling and Analysis Division are launching a periodic feature to help keep you informed of air quality research that may affect your life"... Modeling Matters." The Atmospheric Modeling and Analysis Division (AMAD) leads the development and evaluation of predictive atmospheric models on all spatial and temporal scales for assessing changes in air quality and air pollutant exposures, as affected by changes in ecosystem management and regulatory decisions, and for forecasting the Nation's air quality. AMAD is responsible for providing a sound scientific and technical basis for regulatory policies to improve ambient air quality. The models developed by AMAD are being used by EPA, NOAA, and the air pollution community in understanding and forecasting not only the magnitude of the air pollution problem but also in developing emission control policies and regulations for air quality improvements. AMAD applies air quality models to support key integrated, multidisciplinary science research. This includes linking air quality models to other models in the source to outcome continuum to address effectively issues involving human health and ecosystem exposure science. 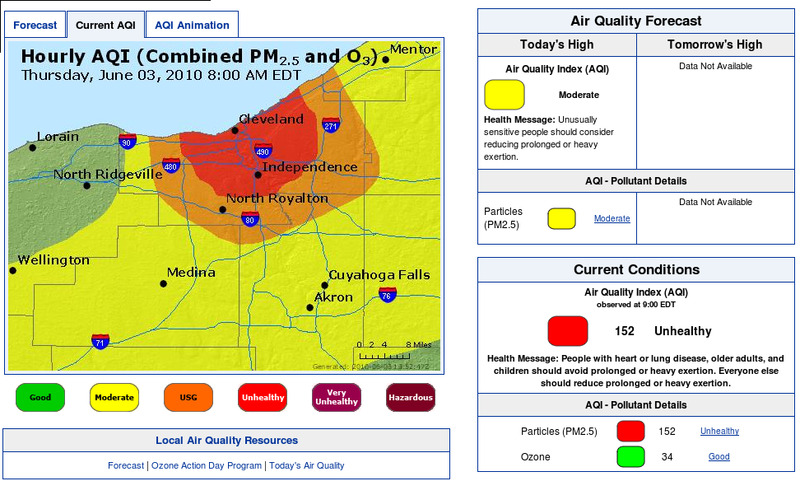 So, if you consider what I ask of the EPA, in providing world-class environmental monitoring and modeling of air pollution for Northeast Ohio, is unreasonable, or beyond government abilities, consider... from Modeling Matters: "My colleagues and I are regular people with normal jobs, and we are fully aware of our charge to serve the public. We’re the ones rolling up our sleeves and making the changes to improve the models that influence some big decisions on environmental issues. Sometimes we work on controversial scientific topics." Develop, evaluate, and refine scientifically credible and computationally efficient process simulation and numerical methods for the CMAQ air quality modeling system. Develop the CMAQ model for a variety of spatial (urban through continental) and temporal (days to years) scales and for a multipollutant regime (ozone, PM, air toxics, visibility, acid deposition). Adapt and apply the CMAQ modeling system to particular air quality/deposition/climate-related problems of interest to EPA, and use the modeling system as a numerical laboratory to study the major science process or data sensitivities and uncertainties related to the problem. Use CMAQ to study the inter­relationships between different chemical species as well as the influence of uncertainties in meteorological predictions and emission estimates on air quality predictions. Collaborate with research partners to include up-to-date science process modules within the CMAQ model system. Pursue computational science advancements (e.g., parallel processing techniques) to maintain the efficiency of the CMAQ model. The CMAQ model was initially released to the public by EPA in 1998. Annual updated releases to the user community and the creation of a Community Modeling and Analysis System (CMAS) center that provides user support for the CMAQ system and holds an annual CMAQ users conference have helped to create a dynamic and diverse CMAQ community of over 2000 users in 90 different countries. CMAQ has been and continues to be extensively used by EPA and the states for air quality management analyses (SIPs; CAIR, CAMR, RFS-2 rulemakings), by the research community for studying relevant atmospheric processes, and by the international community in a diverse set of model applications. Future research directions include development of an integrated WRF-CMAQ model for two-way feedbacks between meteorological and chemical processes and models, and extension of the CMAQ system to hemispheric scales for global climate-air quality linkage applications and to the neighborhood scale for human exposure applications. A flowchart that outlines the various components of the CMAQ modeling system. To assure that we provide quality products to regulatory, academic, and other end-users, we conduct extensive evaluation studies to rigorously assess air quality model performance in simulating the spatio-temporal features embedded in the air quality observations. We comprehensively analyze the performance of meteorology, emissions, and chemical transport models to not only characterize model performance, but also identify what model improvements (inputs or processes) are needed. Thus, model evaluation efforts are tied directly with model development. The Division has developed a framework to classify the different aspects of model evaluation under four general categories: operational, diagnostic, dynamic, and probabilistic. Operational evaluation is a comparison of model predicted and observed concentrations of the end-point pollutant(s) of interest and is a fundamental first phase of any model evaluation study. Diagnostic evaluation investigates the processes and input drivers that affect model performance. Dynamic evaluation focuses on assessing the model’s air quality response to changes in emissions and meteorology, which is central to applications in air quality management. Probabilistic evaluation characterizes the uncertainty of air quality model predictions and is used to provide a credible range of predicted values rather than a single “best-estimate”. Since these four types of model evaluation are not necessarily mutually exclusive, research studies often incorporate aspects from more than one category of evaluation. Model outputs are compared to observations using various techniques including: (a) time series of daily maximum 8-hour O3 concentrations from a 200-member CMAQ model ensemble at a monitoring site in an urban location; and (b) percent contribution of individual aerosol species comprising the total average regional PM2.5 mass concentrations predicted by CMAQ and measured by the Speciated Trends Network (STN) sites. How will future climate change affect air quality? How do short-lived air pollutants impact atmospheric dynamics on regional and global scales? What will be the regional-scale impact of climate change on precipitation patterns? How will emission controls implemented for air quality management impact climate change? What are the most cost-effective ways to mitigate climate change by reducing concentrations of pollutants that contribute to radiative forcing while meeting air quality goals? Developing alternative scenarios for future U.S. emissions of ozone precursors and species that form atmospheric particulate matter. Developing methods to generate a range of future regional-scale climate scenarios via dynamic downscaling and statistical downscaling. Developing integrated decision-support tools for rapid assessment of emission scenarios designed for improving air quality and mitigating climate change. Using the coupled WRF-CMAQ meteorology and chemistry model to investigate feedbacks of future emission scenarios on radiative budget. EPA Administrator Lisa Jackson's finding that greenhouse gases threaten human health and welfare. This research theme applies existing models and tools, and develops new tools and approaches, to link air quality to human exposure and human health. Typically, epidemiological studies rely on ambient observations from sparse monitoring networks to provide metrics of exposure. Yet, for many pollutants in urban-areas, large spatial variations exist – particularly near roads and major industrial sources. Further complicating the issue, ambient concentrations do not necessarily represent actual exposures, which can be influenced by the infiltration of ambient concentrations into indoor facilities (such as automobiles, homes, schools, and work places) and the activity of individuals (such as outdoor exercise, walking, commuting, etc.). Finally, populations are also impacted by the transport of pollutants. These multiple factors affecting exposure require approaches that scale from regional to local environments, and to the individuals experiencing the exposure. Thus, this research provides analytical and physical modeling approaches that provide the spatial and temporal detail of concentration surfaces needed to understand the relationships among pollutants emitted, the resulting air quality, and exposure of humans to these pollutants. Research conducted under this theme focuses on developing analytical tools and methods based on models and observations to improve the characterization of human exposure, evaluate the effectiveness of control strategies with respect to health outcomes, and address critical exposure issues, such as exposure to multiple pollutants, for multiple scales. Ecological resources are exposed to atmospheric pollutants through wet and dry deposition processes. A long term goal of multimedia environmental management is to achieve sustainable ecological resources. Progress towards this goal rests on a foundation of science-based methods and data integrated into predictive multimedia, integrated multidisciplinary, multi-stressor open architecture modeling systems. The strategic pathway aims at progressing from addressing one stressor at a time to a comprehensive multimedia-multi stressor assessment capability for current and projected ecosystem health. Over the next several years, the Amospheric Modeling and Analysis Division's (AMAD) goal for air-ecosystem linkage is the consistent interfacing of weather, climate and air quality models with aquatic and terrestrial ecosystem models to provide the local atmosphere-biogeochemical drivers of ecosystem exposure and resultant effects. A goal is also to harmonize the connection of the local ecosystem scale (tens of km2) with the regional airshed scale (thousands to millions of km2). The physically consistent linkage of atmospheric deposition and exposure with aquatic/watershed and terrestrial models is central, has not received adequate attention to date, and needs further development. Want smart workers in NEO? Consider "High-fat diet could harm the brain"